During the summer period, cooling your home is necessary for your health as well as your comfort. The good thing is that the window unit is kept wholly outside your living room. People who appreciate reduced clutter find this attractive. 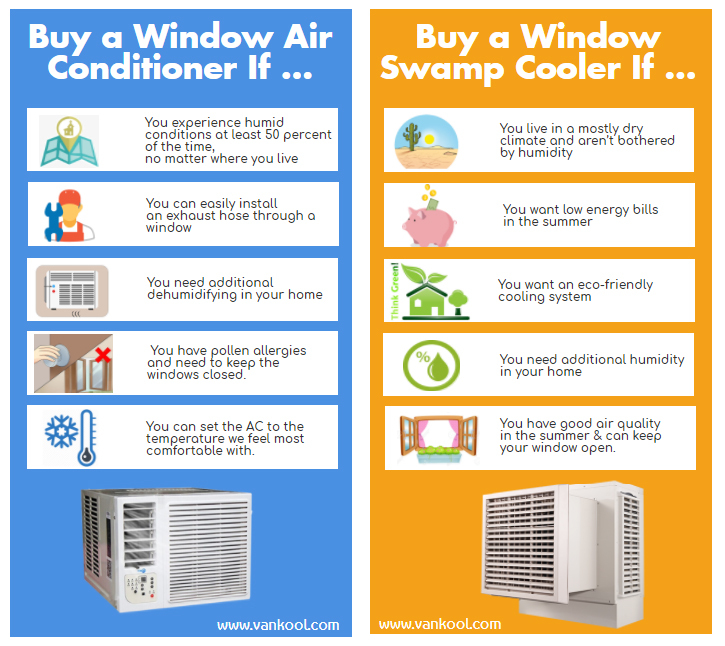 For you to get cool and refreshing air, you have two options: A window swamp cooler or window air conditioner. When analyzed, they each have their own advantages and disadvantages. Before you can conclude which fit best for you, you have to get an understanding of how they work. 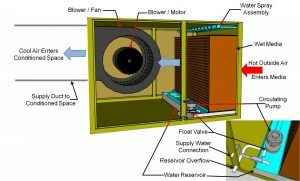 How Does Window Swamp Cooler Work? If you own a home in a low-humidity area, then a window air cooler is ideal for you. It works by letting air pass over a damp pad. The moisture found on the pad evaporates and hence cools the air and adds humidity or moisture. The swamp cooler needs water control and continuous water addition for it to work properly. This appliance is not ideal to install in an area where there exists a lot of moisture primarily. How Does Window Air Conditioner Work? Air conditioners cool the air by removing and condensing the water that is existing in the air. It contains a chemical that converts from a gaseous state to liquid then to gas again with ease. The chemical absorbs the moisture in the air and this leads to the cooling of surrounding air. The cool air is released from the compressor while the warm one is let back outside. With air conditioners, you have accurate control of your home temperature. Air conditioners can lower your home temperature to a substantial degree. They are also considered ideal for humid areas as they lower the humidity when cooling the air. 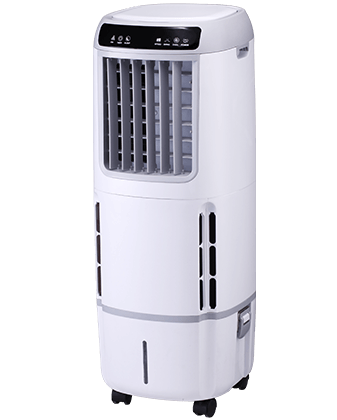 Window evaporative air cooler is an energy efficient method of cooling a home. 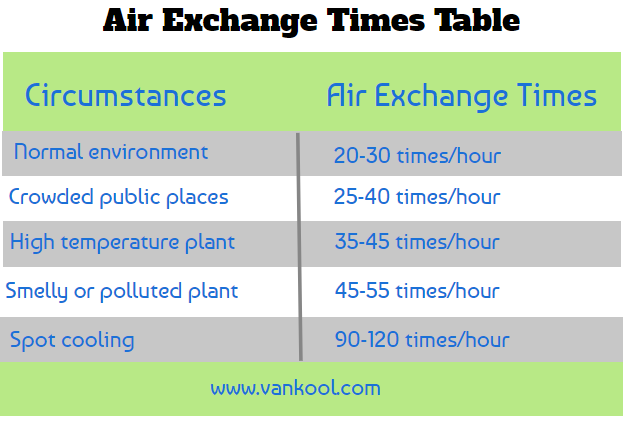 Compared to air conditioners, they have no chemical and use about 15%-35% of the electricity used by air conditioners. However, they do require a constant water supply. They may, therefore, prove not efficient in areas experiencing water restriction or drought. They are also not as effective as air conditioners when it comes to cooling the air in various weather conditions. Window Swamp Coolers work best in hot and dry climatic conditions, such as in desert regions. This is because they function by adding moisture to the air making your home have a more comfortable feel. In humid regions, swamp coolers can only lead to excess humidity giving room to the growth of mold or mildew. 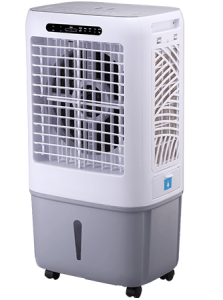 Air conditioners are effective in almost all climatic conditions but they can also make the air dry. It, therefore, makes their use more effective in humid areas. Using air conditioners in dry climate could make the air too dry and might lead to eye and skin complications. Window air conditioning gadgets cost somewhere between $345 – $1,190. They normally come complete with a DIY manual. 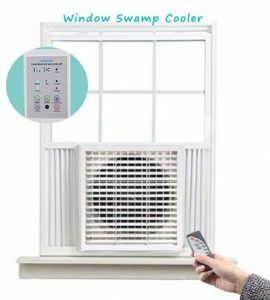 On the other hand, window swamp coolers are priced between $400 – $1000. They require no professional help to install. 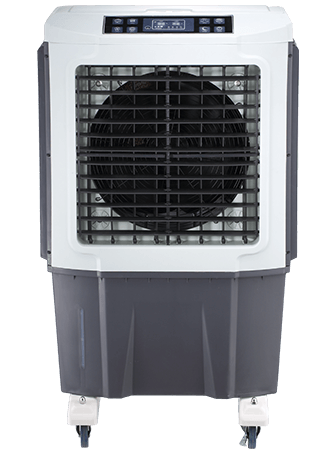 Window mount swamp cooler tends to have reduced levels of CO2 and greenhouse gases emissions when compared to air conditioners. This is because swam coolers utilize the use of water to cool the air. Air conditioning units on the other hand use cooling or refrigerant chemical. When this chemical is converting into gas or liquid, it emits CO2 and greenhouse gases. This becomes harmful to the environment as well as the air we breathe. 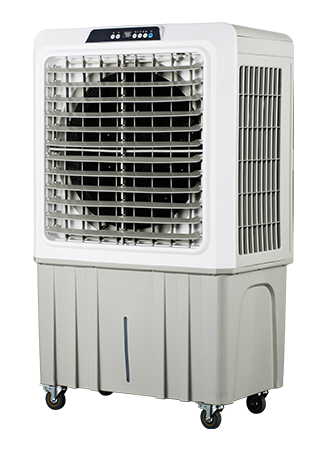 Window AC tend to produce more noise compared to window evaporative cooler. The noise in air conditioners occurs when the condenser is working to convert the chemical into either gas or liquid. Window unit swamp coolers will need no professional services to install in most situations. Window air conditioning units, on the other hand, might need the help of a professional or a detailed DIY manual. For window air cooler to function properly they require maintenance daily, monthly, and yearly. This also involves changing the pad when necessary and controlling the water. Most of the maintenance jobs are DIY. You can also do a professional yearly service of about $100. 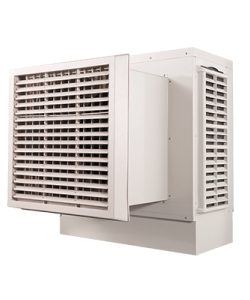 The swamp cooler units require more concentration in maintenance compare to air conditioners. Ait conditioners are meant to be serviced yearly. The yearly maintenance includes changing the filter, charging the chemicals, and cleaning. The cost to the yearly servicing is about $70 – $100. Air conditioners have parts that are prone to failure. These parts can lead to an additional yearly cost of about $250 and $ 2,000. It, therefore, makes them more expensive in terms of maintenance. 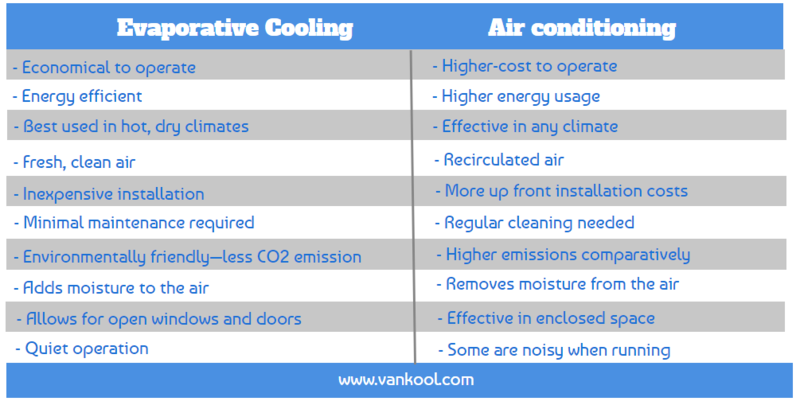 So which type of cooling is better for you? Check out our cheat sheet to help you decide. The rating of window swamp coolers is in terms of Cubic Meters Per Hour (CMPH) of air that is delivered in a home. A number of window units range from 4000 to 8000 CMPH. Here is a simpler way to calculate. Follow the example. The efficiency of the coolers is dependent upon pad design aspects and the quantity of humidity in the air. Aspen tree fibers are used to make Aspen Media Pads. The fibers are connected to form a pad by use of plastic netting. It is economical and durable. Honeycomb Cooling Pads (also call Rigid Media Pad, Cellulose pads) are designed for maximum efficiency and very minimal maintenance. 12 and 8 media depths are accessible. If well maintained, the pads can last long. 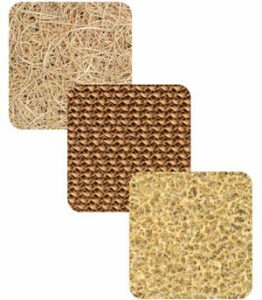 Polyester Media Pads are made out of fiber distributions that are random. These fibers are laid in a multidirectional way to create a solid media. This leads to multiple crossover sections which help to trap particles and dust. This is important step is to choose the brand. 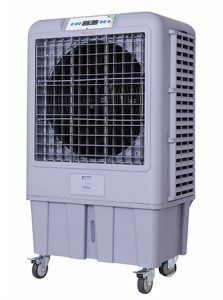 Some popular brands of air coolers are Honeywell,etc. 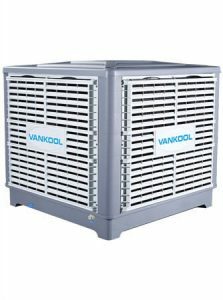 While if you want to be an air cooler dealer and buy air coolers in bulk, you should consider the manufacturers to get a more competitive price. The internet is definitely the best place to get information about manufacturers. Popular sites like MadelnChina.com and Alibaba.com have detailed information about it. – Vankool OEM supplier for Honeywell for more than 12 years.